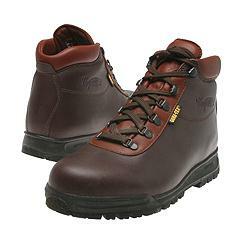 I just ordered my eighth pair of Vasque Sundowner boots, which have been my go-to boots since I began hiking more than 20 years ago. Here’s why I love them and keep coming back for more. Currently dubbed the Vasque Sundowner GTX (also often called the Sundowner Classic), its distinctive burgundy color and design make it easy to recognize on the trails and on the store shelves. Despite all of its advantages, Sundowners have one significant drawback: a significant lack of cushioning underfoot. Compared to most of today’s hiking boots, Sundowners offer little in the way of shock-absorbing materials under the heel or forefoot. I address this problem with the use of Superfeet, which provides me with ample cushioning under the heel. The Sundowner is also available in black and brown, though my one experience with a different color many years ago (black) was poor—it fit differently, and much less comfortably, in the heel. I’ve stuck with the original burgundy ever since. With care, a pair of Sundowners can last for years. I’ve ended up replacing mine because: 1) The sole wears down, especially on the outer heel area due to my pronation and/or 2) The leather starts to split and crack at the flex point across the toes. Both of these problems could be addressed with better care and maintenance than I provide. You can get them resoled. You can also prevent the leather from cracking by applying some leather conditioner to the boot once or twice a year. Even with minimal (or no) maintenance, each pair of Sundowners has lasted me between 500 to 1,000-plus miles on the trails, plus many days and weeks of around-town wear during the winter months. I’m not the only one who swears by these boots. Check out the abundant rave reviews on Zappos.com, where it earns a consistent five-star rating (and retails for $180). “Equipped” is an AMC Outdoors blog, written by Matt Heid. Equipped blogger Matt Heid is AMC's gear guru: He loves gear and he loves using it in the field. While researching several guidebooks, including AMC's Best Backpacking in New England, he has hiked thousands of miles across New England, California, and Alaska, among other wilderness destinations. He also cycles, climbs, and surfs.